The Perioperative Surgical Home (PSH) is a multi-departmental initiative to increase the quality and safety of surgical care, decrease the healthcare costs, while simultaneously improving patient and provider satisfaction. 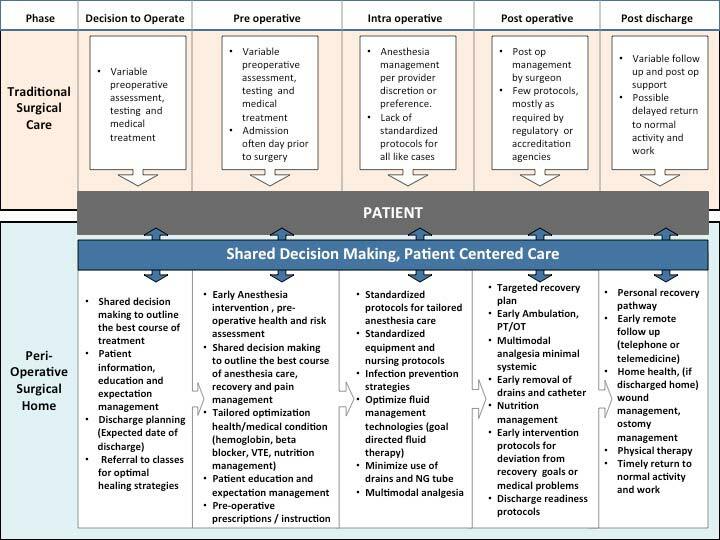 This new integrated team is focused on a patient-centered continuum of care that expands the anesthesiologist’s role from the operating room to the entire surgical episode. The Perioperative Surgical Home Team coordinates the care for the patient through every phase of the surgical experience, from the moment the decision for surgery is made, through pre-operative, intraoperative, postoperative, discharge home and extending to 30 days post-discharge from the hospital. As the common denominator physician in surgical care, anesthesiologists have the expertise to seamlessly integrate PSH into a hospital system and beyond. Currently, surgical care is varied and often fragmented with little communication between the various phases of surgery, which results in redundancies and complications that could have been avoided. By creating clinical pathways centered on the patient as opposed to the procedure, the anesthesiologists, surgeons, hospitalists, nurses and other patient care providers work with the patient. Efforts are made to determine the most cost-effective implants and pharmaceuticals, decrease the number of unnecessary tests and consults that must be performed pre-surgery, optimize patients before surgery and reduce the overall rate of complications after the surgery. The net result is a reduced hospital length of stay and the overall healthcare costs, which translate to improved patient experiences and overall better patient care. The PSH also improves the surgeon satisfaction level because the surgeon and the surgery clinic off-load non-surgical work to the anesthesiologists, which give surgeons more time to focus on surgery. The goal of the PSH is to standardize evidence-based practices in surgical care and become a model for excellence in surgical care.